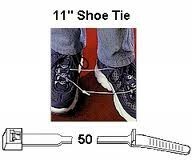 Shoe Ties are designed with a unique stop that keep the tie from tightening past a certain point. Creates a loop that assures security while it permits easy try on capabilities. Almost impossible to break by hand. Ideal for the retail shoe industry. 11 Inch 50 lb. shoe tie has a 3" Bundle Diameter and a width of approximately .19". 24 Inch 50 lb. shoe tie has a 6" Bundle Diameter and a width of approximately .15". 30 Inch 50 lb. shoe tie has a 9" Bundle Diameter and a width of approximately .15".